15% OFF Now-5/25/19! BEACH VIEW Updated @ Resort! Pool~Hotub~Gym + VIP Perks! 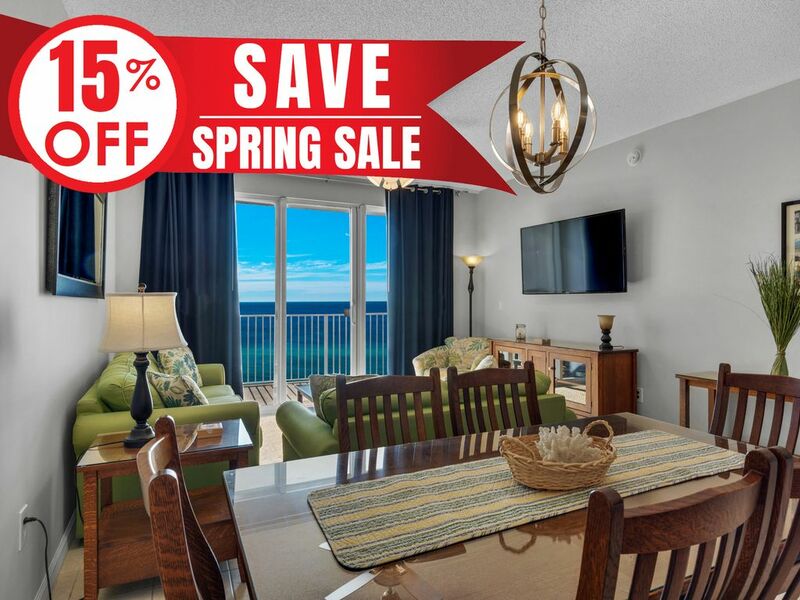 This beautiful 7th floor updated beach condo offers captivating views of the Gulf of Mexico right from the private balcony at Majestic Sun 712A in Destin! Enjoy the gorgeous views or stroll across the street and lounge in the sugar white sand. This condo comes with two beach chairs and an umbrella, so you don’t have to worry about beach service, just grab ‘em and go! If you are looking for a relaxing time, reserve Majestic Sun 712A today! As you enter this amazing recently updated condo, you are greeted with fresh contemporary paint, a full kitchen with brand new granite counters, modern LED pendant lighting, and newer stainless steel appliances including a super quiet dishwasher, ceramic top range, a refrigerator with ice maker and microwave. You will also enjoy the dining area and living room with Amish quarter sawn white oak furniture, beautiful tile flooring, and floor to ceiling sliding glass doors that lead to the balcony with full Gulf views. This condo has a fresh and friendly feel that bring a welcoming Florida vibe to the space. The master king suite bedroom features a new mattress as of 2017, a 32-inch flat screen HDTV with DVD player, and private bathroom. The second bedroom offers two full-size beds and a 32-inch flat screen TV with DVD player. An adjoining bathroom is attached to this bedroom. In the living room, you will also find a queen size sofa sleeper. This captivating condo can easily accommodate up to eight guests, perfect for your next beach vacation! My husband and I had been talking about going on a vacation with the kids over their Spring Break for months. Last minute decision and based on availability and location, we chose your facility (A712)! It was very affordable given how last minute it was that we booked it. Extremely clean, well maintained, and right across the street from the beach! It was perfect for our family of 5. Walking distance to several things and on the chilly nights it wasn't a big deal to drive either as parking was still available. It was exactly what we needed. The heated pool and hot tubs were a great way to warm up in the evenings. There were a few items that were missing on arrival and after we called to inform the front desk, they arrived immediately. Extremely friendly and excellent customer service! Will be staying here again when we come back. I have recommended this place to many people already. We enjoyed our stay. The entire property was clean and the condo was awesome. It was clean and well maintained. We've previously stayed at Majestic Sun and this was our third trip. This unit was ok. The beds were uncomfortable (even the Tempurpedic Sofa, due to the bar coming through). The coffee pot, the iron, and the toaster were broken; however, Destin Palms replaced them immediately. Our biggest issue was too many umbrellas and chairs too close together on the beach. It was virtually impossible to get onto beach without moving the umbrella tops. The rule about not placing a tent or cabana south of "these signs" was ridiculous. The umbrellas were placed right by the water, making a nice view and walk to beach impossible. We will not return to the Majestic Sun in the future. Overall the property was nice; but, every time we went out onto the balcony we were chased back in because someone was smoking! It was super convenient that it took me only 3 mins walking to the beach. The place was clean and it had everything you need for a vacation. It is a great place. I would recommend this place to my friends and come back again if I have a chance in the future! Methods of payment we accept are as follows; Visa, MasterCard, and Discover. *Please note we do NOT accept American Express. Rates Shown Above Do Not Include Taxes and Fees 7) CANCELLATION POLICY: For reservations made 90 days or more in advance, the initial payment of 35% of the total reservation is due at the time of booking. The remaining balance will be due 90 days prior to arrival. There is no penalty for cancelling within 24 hours of the time of booking. Cancellations made outside of 90 days of arrival will forfeit the initial payment plus the reservation processing fee. Cancellations made within 90 days of the reservation will forfeit the full amount of the reservation. Early departure does not warrant any refund of rent. We highly recommend guests obtain travelers' insurance, which provides reimbursement for cancellations made under a specific set of circumstances. Contact a Destin Palms vacation planner to discuss what issues are covered by the policy.